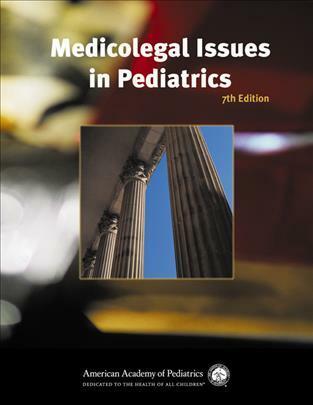 Medicolegal Issues in Pediatrics offers a wide range of medicolegal topics that affect the practice of pediatrics from residency through retirement. It provides pediatricians with detailed information on common pediatric malpractice claims and specific risk management strategies to reduce the threat of being sued and make it easier to defend a claim. In addition, it explains in simple language the anatomy of a malpractice lawsuit, guidance for coping with malpractice litigation stress, and the basics of professional liability insurance for pediatricians. Resources for managing the specific risks of newborn care, adolescent care, and pediatric emergency medicine are included. New to this edition are chapters on the medicolegal risks associated with the reporting of child abuse and neglect, health care fraud and abuse, and an expanded chapter on patient safety. Selected as a Doody's Core Title and given a 3 Star Review! This book provides a good basis for understanding the legal issues faced by pediatricians in practice or training, and others who care for the medical needs of children. It serves as a basic guide to legal issues such as licensure, liability, contracts, and malpractice coverage. The update on healthcare fund and abuse is particularly pertinent in today's environment as is the review of liability as a volunteer, an issue that is not often covered. There are few comparisons to this book from the American Academy of Pediatrics and written by an expert panel. Steven M. Donn, MD, FAAP, is a professor of pediatrics in and the director of the Division of Neonatal-Perinatal Medicine at the University of Michigan Health System. He is actively involved in teaching, research, and patient care. In addition, he is a Fellow of the American Academy of Pediatrics and chaired the Committee on Medical Liability and Risk Management from 2008 to 2012. Dr. Donn has authored more than 220 medical journal articles, edited 27 books and specialty journals, written over 200 book chapters, and has produced numerous educational materials. Gary McAbee, DO, JD, FAAP, is chief of pediatric neurology at Meadowlands Hospital Medical Center and Meadowlands Physician Associates in New Jersey. In addition, Dr. McAbee is a professor of pediatrics (neurology) at the Robert Wood Johnson School of Medicine and a professor of neuroscience at the Seton Hall School of Health & Medical Sciences. Dr. McAbee is also an attorney and was the chair of the Committee of Medical Liability and Risk Management of the American Academy of Pediatrics from 2004 to 2008.